After a restful night's sleep, we woke up slightly late to see much clearer skies. Though it was still cloudy, it was a very welcome change from the dark clouds that had stayed with us all through our Melbourne stay. The weather was significantly hotter than Melbourne, and though I welcomed the higher temperature I hoped it wouldn't get too high. I still like my holidays to be cooler than what Singapore offers. We made sandwiches in the room using the stuff we had bought the previous night. We downed it with some juice and tea (the lodge provided fresh milk but you had to go down to reception to get it) and checked out of the lodge. After the long drive of the previous day, I expected Xena to protest when it was time to belt up. But she was an absolute angel. Not only did she happily get into her car seat, she was very cheerful and chatty. Just as we were about to drive off, I saw some shops that had just opened. Viv asked me if I wanted to take a quick look and I happily obliged. The first one just had Christmas decorations and stuff, but the second - Dimmeys - had some kind of crazy sale on clothes. It was SO crazy that I found a beautifully fitting pair of capri pants for... $2.99. I kid you not. It was also the fastest shopping I'd ever done. We were in and out of the shop in five minutes flat. The plan for the day was to drive to Ryde, our base for Sydney, but with a stopover at Bowral for the International Cricket Hall of Fame (formerly known as the Bradman museum, but now expanded to showcase more). The museum is adjacent to the Bradman Oval where the young Sir Donald honed his legendary cricketing skills. He even chose this location as his and Lady Bradman's final resting place. The entry fee to the museum is $20 entry per adult. I had no intention of spending hours in a cricket museum, so I told Viv and Appa to go ahead, while I would entertain Xena by myself. Though Xena likes wielding her plastic bat at home, I highly doubted her interest in a cricket museum. Bradman was born in Cootamundra but had spent his early years in Bowral. That's how he got the nickname 'the boy from Bowral'. There was even a section on Tendulkar! 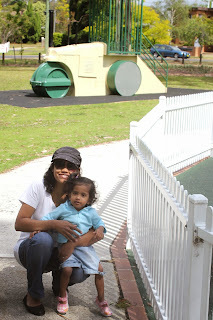 While the father-son duo spent close to 1.5 hours soaking up the cricket spirit in the museum, the mother-daughter duo had discovered the Glebe Park with a cricket-themed playground for kids! ...and runs in, with Mamarazzi hot on her heels! ...and then this rocking duck (representing the ducks in cricket I suppose). I also made her pose as a batswoman! 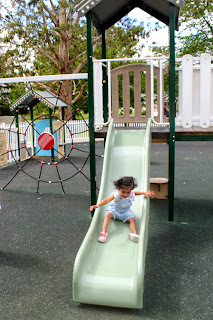 And then we got on what she called the 'diaper wala swing' because of the two large holes in the seat. I have to admit, it did look like a diaper! "Mommy, watch out! Here I come!" After what seemed like eternity, but "only 1.5 hours" according to Viv, they came out of the black hole. Viv said there were a lot of things, especially videos that they wanted to see but didn't have much time for. The weather had been quite bonkers all day. First it was really sunny, then it got so windy when we were at the playground that I had to fetch Xena's jacket from the car, and then suddenly it was drizzling. We had lunch at Solfood, a vegetarian place that served familiar fare such as laksa and Malay curry! We even found a Target near the lunch place and picked up a pair of shoes for me, a t-shirt for Viv and a pair of boots for Xena. And then we were off to Ryde! We had booked a place through airbnb.com. It was our first experience with airbnb and we didn't know how it would be to stay in someone's house instead of a hotel. The house was in a very cute locality with lovely purple flowers on the trees. Our hosts turned out to be really warm and friendly too. Once we entered our room, we were greeted with candy on the pillow, as well as a welcome folder with the wifi password, menus, brochures, church locations, etc. I was very impressed with how well thought-through everything was. We decided to take a walk and explore the area as well as have dinner. The weather still looked iffy so we armed ourselves with our Penguin Parade raincoats. They turned out to be a real lifesaver because as soon as we left their house, the rain came pouring down. It was so bad that our hosts actually called Viv's mobile to check if we were ok. We were fine and I was actually enjoying walking in the rain, but we didn't find much to eat. We settled for Domino's and ordered two thin-crust vegetarian pizzas. They didn't have seating but there was a bench just outside where we intended to sit and eat. However, it started drizzling again, and we found an empty table in the small mall next door (everything was closed but the table and chairs were outside a restaurant). So we sat there and had a nice dinner before heading back.